I am Vicki Bolton, a PhD student at the University of Southampton. My studies are sponsored by the Economic and Social Research Council. I am part of the division of Social Statistics, where I am supervised by Prof. Patrick Sturgis. Dr. Bryony Hoskins, whose work includes civics and youth political engagement, is also a member of my supervisory team. I am connected a body of work on the third sector via my other supervisor, Prof. John Mohan. I am trying to decide whether volunteering can make someone more political. You can safely blame Robert Putnam’s Bowling Alone for most of this. He held a branch out to a drowning political system: you could reverse the decline in voting and other types of political engagement if only you could increase social capital. Social capital is a slippery concept. Putnam uses it as a cover-all for a society’s “norms of reciprocity and networks of civic engagement” (1993: 167). For example, you might be a member of a network (e.g. an association such as the Red Cross) which produces norms of civic behaviour (e.g. the expectation that neighbours will check on older people in very hot weather). Or as a second example, you might live in a village which shares a collective expectation (norm) that residents will maintain the village pond, and so you find yourself joining the pressure group (network) Pond Conservation. Norms cause networks and networks cause norms – very reciprocal, very slippery. It gets still more slippery when you try to measure it. Even if you content yourself with measuring networks alone (and ignore norms as much as possible) you are left with an array of choices. Do you measure memberships? Numbers of meetings attended? Numbers of social contacts? Range of memberships? Time spent? Nature of time spent (i.e. is volunteering to coach a sports team a higher value activity that playing in the team, from a social capital point of view)? Putnam’s assertion that “volunteering is part of the syndrome of good citizenship and political involvement” (2000: 132) is hugely appealing to policy-makers. Volunteering is intuitively much simpler to understand than social capital and it seems easier to measure. What if promoting volunteering could fix democracy…? But I suspect that the slipperiness of the concept has allowed researchers and policy-makers to get over-excited about something which cannot really save us from falling voter turnout and declining political engagement. I don’t think that an increase in volunteering would produce an increase in political engagement. So I’m spending three years looking at the available longitudinal data from the UK to try to sort it all out. Wish me luck. Incidentally, I’ve always been quite taken by the medical diagnostic homily about hearing hoof beats and looking for horses (rather than zebras)… It’s supposed to warn doctors not to over-diagnose rare illnesses. I’m beginning to think we need something similar for social science: the drive to publication is so strong that there is a clear incentive to look for zebras. 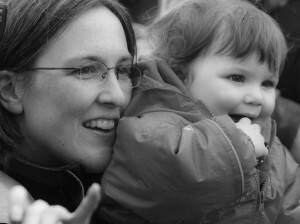 Speaking of which, the picture on the left is of my daughter and me doing just that (at Marwell Zoo). Really, this was just a way of shoe-horning in a picture: so now you know what I look like!